Because having old greasy food residue on/in what you're cooking with is disgusting and of no benefit...just like it is on your dishes, glasses and utensils. We'll just agree to disagree on this and leave it at that. What's called "seasoning" - and is a good thing - on cast iron is called "crud" on your other cookware. I'm not taking sides here, although I do agree with Ember, but couldn't you just as well ask why one wouldn't scour all the "crud" off your cast iron, since you do on the other utensils? I always use hot water and a stiff brush on my cast iron - and have done for the last 40+ years - and once they're seasoned they stay that way. I did try washing a few of them in soap and water a long time ago and then had the "pleasure" of having to de-rust and re-season them....I haven't bothered with that again. I guess it all comes down to what we think works for us: even if it's a placebo, it still makes us feel better! What's called "seasoning" - and is a good thing - on cast iron is called "crud" on your other cookware. Not true. Properly "seasoned" cast iron cookware is coated in layers of fats that have been polymerized through high heating, a process that causes the fats to break down and recombine into long chain polymers that, when cooled, form a hardened plastic-like protective shell over the iron. If you have "crud" on your cast iron, that isn't seasoning. It's fat/oil that hasn't been polymerized. but couldn't you just as well ask why one wouldn't scour all the "crud" off your cast iron, since you do on the other utensils? I do scrub all the crud off my cast iron (using soap and water) because it isn't seasoning (which is not effected by modern dishsoap). That happens when there are gaps in the polymerized coaring and you don't thoroughly dry after washing. I've never once had rust form on my CI cookware in well over 20+ years of washing it. I heat my cast iron skillet on my gas grill outdoors. 10 to15 minutes on high and it is ready to go! 30/40 seconds each side is fine. For your husbands sake just let the skillet cool down and rub well with a paper towel and plenty of coarse kosher salt then just put it away till next use. 1) A propane "flamethrower", typically sold as a weed killer in hardware stores ($20 at Harbor Freight). Hands down the fastest method that minimizes the amount of meat given up to crust. The guys at Sous Vide Everything did a two-month competition among 12 different searing methods and the flame thrower came out on top. Only downside--can't use it indoors. 2) Charcoal starter chimney where the steak is placed directly over the stack of red hot coals. Approximates restaurant temps of close to 1000 degrees. 3) Cast iron skillet that's been heated in a 500 degree oven for at least 20 minutes. I found that the stove top can't really reach 500 on its own. Thanks for the info for using a “weed killer “ attachment for my propane tank. Never thought of it as a possibility. It's a blast--literally! Sounds like a jet engine. Definitely a "guy' thing but really gets the job done. Enjoy! So next question. As I stated before I have a glass top stove. There seem to be varying opinions whether cast iron can be used on the glass. Your thoughts? I have a glass topped induction stove and use an enamelled CI skillet all the time. Just don't drop it!! Likewise, i use CI all the time on glass cooktop. If the CI pan is new run your hand beneath it to check for any burrs or sharp spots that might scratch your cooktop. They can be removed with emery cloth. My best successes have come from refrigerating the meat overnight after fully pasteurizing it in the bath, then searing it before serving. Overnight cooling helps to limit the maillard reaction to the outermost part of the meat and avoid overcooking the insides. As advised above, it is vital you pat dry all of the sides to be seared. I have a glass top and use CI most of the time for cooking. I put the pan on at 2 on the burner for 20 min and the turn up to 4, 5 min before starting cooking. This gives me the best results for a delicious crust on steaks and burgers. As far as other post about caring for Cast Iron: yes you can wash ci with soap and water, but the point is to carbonize the residual food left in the pan to help the "non-stick". There is no non virus, bacteria or Enzyme or anything that can survive above 200d. I'm hoping you meant "rare to medium rare". You need closer to 500°F for a decent sear, especially at 30 seconds / side. Who sears a steak on the edges? Does that look like medium to medium-well? I sure as heck do, to render and caramelise the fat. I think you'll find as many (or more) do as don't. The fat does not, but the matrix that supports it does once the fat is rendered out. Thus far, the easiest, fastest, cleanest and most efficient foolproof indoor searing of "SV tenderized food" that I've found is the T-Fal Optigrill XL (smaller models exist) because it sears top and bottom simultaneously with little or no smoke, no splashing, no mess, no effort, no guessing and quickly. Butter, clarified butter, ghee or mayo are optional, of course. 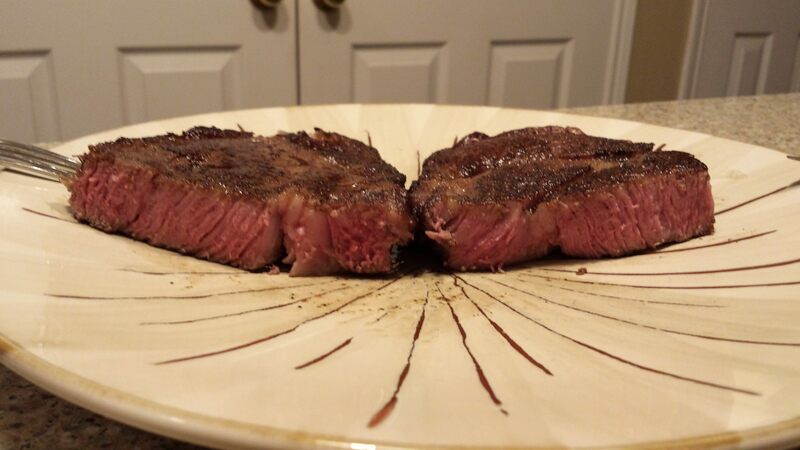 Classic grill marks are perfect. Choice of automatic controls or manual operation. Cleaning is a cinch. Outstanding results. No need for BBQ, Searzall, or pan searing! Problem solved!